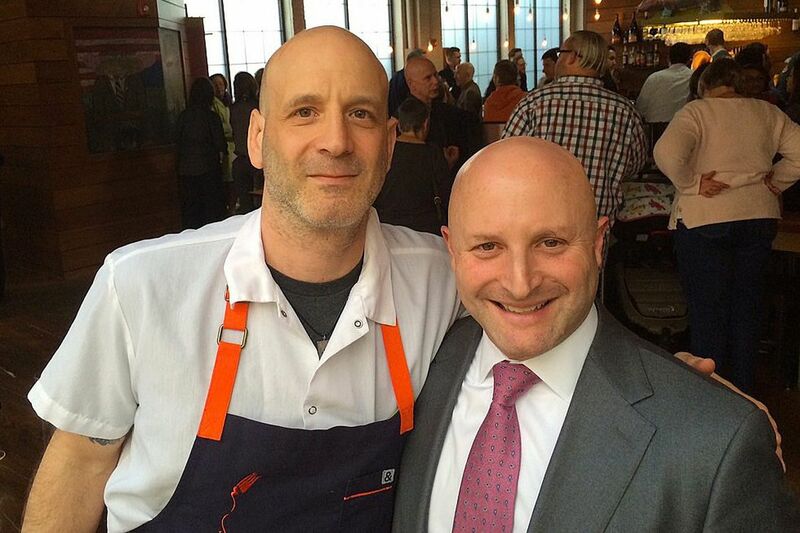 Marc Vetri (left) and Jeff Benjamin. Chef Marc Vetri has followed business partner Jeff Benjamin out of the door at Urban Outfitters — two years after selling the bulk of the Vetri restaurant empire to the Philadelphia-based retail giant. Vetri and Benjamin still own and operate Vetri Cucina, the city's top-rated Italian restaurant, at 1312 Spruce St. in Center City, and they are planning to open a second Vetri Cucina at the Palms Casino in Las Vegas. The other brands — Pizzeria Vetri, Amis, Bar Amis, Osteria, and Alla Spina — operate under Urban, as they have since the late-2015 sale, which was valued at about $20 million. Vetri and Benjamin retain the charitable arm, Vetri Community Partnership. "I just thought it was the right moment," Vetri, 50, said in an interview Monday morning, a day after announcing his resignation from Urban on social media. "They're heading to do other things. We have our things going on. … Most people, when they leave a corporate job, they have an answer. I just think it was time to go." Vetri said he wanted to focus on Vetri Cucina, which will mark its 20th anniversary in 2018. "Vetri is always evolving anyway. It was the start of everything," he said. "It's always been the catalyst for everything. I just feel that it's most important to focus on that." Since the sale, Vetri has assumed more of a mentor's role, visiting the empire to dispense advice and consult on menus, while cooking at Vetri Cucina. But the Urban-owned restaurants are "still my babies," he said. "I went around to all the restaurants Friday and let everybody know. There were lots of hugs. I told them, 'We're all still family. My house is their house. They helped scale this thing to what it is. They can always stop over Vetri whenever they want to. Upstairs, we have a lab where we're always working on things. They can use it as if it's their own. That's not going to stop." Vetri said that he could have stayed on indefinitely. "Could I have?" he asked. "That was an option, but I just thought… Not really. I felt that I ran with them as long as I was able to. It was a lot of fun. I'm just going to focus on Vetri [Cucina] now." Vetri, who said he never had a desk or office at Urban's South Philadelphia headquarters (or, for that matter, have one at his restaurant), said his departure really would have no impact on the restaurants' operations. "Other than that I'm not officially working for Urban anymore, all those restaurants are still my family, my babies," he said. "I always hope they do awesome." Vetri said chefs Jeff Michaud and Brad Spence, who were instrumental in creating the Urban-owned restaurants, would remain with Urban. An Urban spokeswoman confirmed that Vetri had resigned to "seek new opportunities" and said the company thanked him for "his leadership and contributions during our partnership." Benjamin resigned in August, saying it was time to move on. He recently signed on to oversee Fitler Social Club, a high-end private membership club expected to open in 2019 at 2400 Market St.
Vetri restaurant sales have been healthy. In its third-quarter earnings report, released on Nov. 20, Urban reported nine-month sales of $18.5 million, compared with $16.7 million over the same period in 2016.